Harada Naoatsusa (Mrs. Nonaka) has been teaching minyo singing, shamisen, taiko and narimono since 1990. Her teacher is Japan National Treasure Harada Naoyuki. 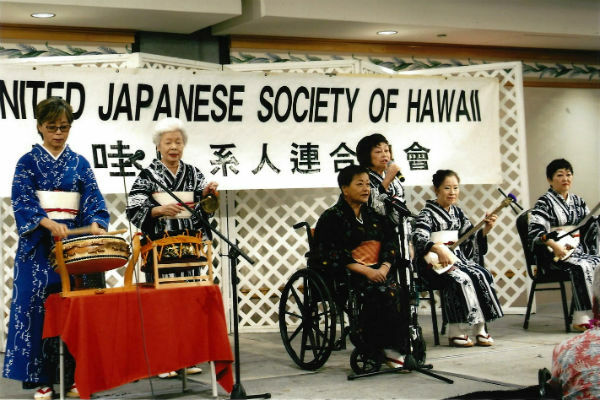 Since 1990, she has held recitals every five years, benefiting local non-profit organizations such as UH Music Dept., Maui Japanese Teachers Association, Hilo Japanese Center, Kuakini Medical Center, and the Tohoku Triple Disaster. She is happy to participate in this special 150th anniversary of the arrival of Gannenmono immigrants.